Yeah, I'm not liking the pastor at all. As for the 'death' taking place next week, I guess we'll find out soon enough. Fingers crossed that it's not Carol. Apparently, a lot of people feel the same, the net is starting to have these images spread around. Those are great! Though I'm also sort of amazed by the idea of people buying/wearing T-shirts that comment on the fate of a TV character. New get-rich-quick scheme: TV-shirts! They'd have messages connected with the plots of popular shows, as they unfold. You'd have a new batch every week. 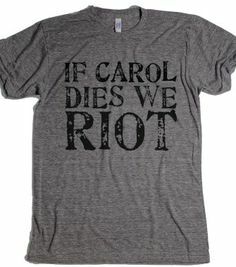 there are a few "If Daryl dies" t-shirts out there too. There's still a lot of debating going on, the majority seem to feel that it's Beth's time to go, possibly Tyrese as well. Well, the mid-season finale is over, and now we know that Beth was the one to die. I gotta say, this episode left me cold. I mean, they went through these episodes making Beth into a mini-badass, and then what does she do? She jabs scissors into someone who is wearing bullet-proof vests and battle clothes. I also don't get the whole thing with Carol this episode. We see her unconscious in the bed....then she's in a wheelchair near the end, and then she's walking away from the hospital under her own power. Well, I am happy that Carol lives to see another day. Now they just need to get rid of that preacher. Really? brings a whole herd of walkers to the church? damn. That seems about right. She'd been built into just a big enough character to matter -- if it had been, say, Tyrese's sister or Abraham's girlfriend it wouldn't have meant much (see? I can't even remember their names). She got to have her moments of heroism. But she's not such a big or popular character that her presence is severely missed. I gotta say, this episode left me cold. I mean, they went through these episodes making Beth into a mini-badass, and then what does she do? She jabs scissors into someone who is wearing bullet-proof vests and battle clothes. As one recap said, "everyone knows that when you stab someone with mini scissors you go for the jugular." 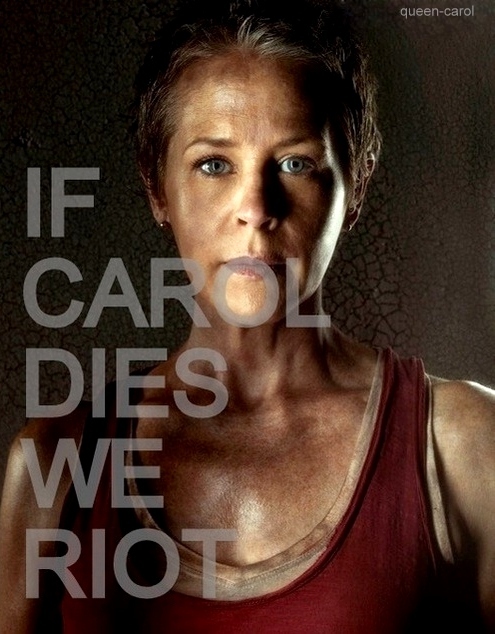 I also don't get the whole thing with Carol this episode. We see her unconscious in the bed....then she's in a wheelchair near the end, and then she's walking away from the hospital under her own power. Right?? She seemed to have made an amazing physical recovery but now appears mentally catatonic -- she never spoke and barely registered a facial expression. And poor Maggie -- to go from seemingly not giving a thought to her sister (in previous episodes, she hasn't mentioned Beth, has shown no signs of concern or grief) to overjoyed that she's been found alive to devastated that she's dead. I know. He's gong to be a big liability. It's almost like he's trying to cause trouble. Time, perhaps, for Rick to activate the cattle vs. butcher approach he seemed to have learned from Gareth. Note that Gareth attacked a guy named Bob. Then Rick killed a guy named Bob (that police officer he ran into and then shot). And apparently, according to the recap I read, they both said the same line to their respective Bobs. Oh, what are their names? Sasha and .........Rita comes to mind, but I'm not sure. Tyrese is not going to last much longer with this 'pacifist' thing he's got going on either. I'm wondering what's going to happen next for her? She's basically 'faced death' after that accident, will she have a death wish now? Think she's invulnerable? I know.....kudos to Lauren Cohan for a great performance! I felt so awful when she saw Beth being carried out. I thought it was pretty ironic the priest ended up outside the locked church, begging for his life, just like he had done to his parishioners. Yeah, unless he wises up, he'll be nothing but a liability, the same for Eugene. that's one word for them.